The Write Question is a weekly video podcast all about writing. 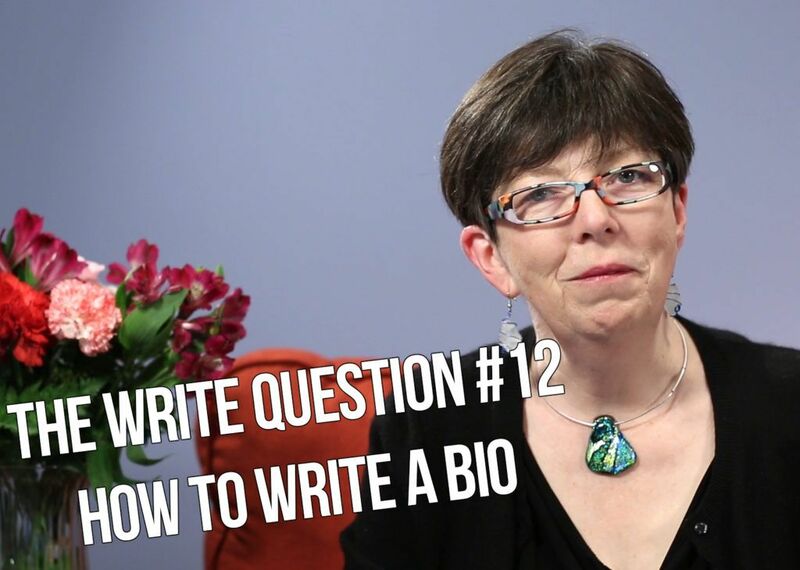 Today’s question focuses on writing a bio. Today I have a question from Roger Lyngholm, who’s a retiree from the OTHER Vancouver — Vancouver, Washington. Roger used to work in a school district but now….wait, let’s have Roger tell the story himself. [Audio:] Now that I’m retired, and no longer relied upon for writing or graphic design, friends have felt compelled to keep me occupied by offering me the opportunity to be responsible for their newsletters. One of which wants a series of one-page bios featuring significant people in their organizations. Is there an accepted format, or things that should be part of every bio? Thanks, Roger. I’ve always loved reading a good bio and, back in my newspaper days, I used to enjoy writing them, too. I wouldn’t say there’s any sort of “mandated format” for bios. But regardless of style, I can absolutely tell you the differences between a good one and a bad one. A good bio arises out of some really strong interviewing. You need to collect interesting, insightful stories. Now, some people remember and tell stories easily and well. It’s like you press a button and all sorts of great quotes begin to spill out. But not everyone is that way, here’s what you need to do in the more challenging cases. First, make the interview as casual and informal as possible. Sit on couches or chairs if you can, rather than behind a desk or a table, like you might be forced to in an office or coffee shop. When you’re starting an interview, it helps to open with really EASY questions. Ask them to spell their name, where they live, and what they do for work. It’s also important to ask your subject specifically for stories, anecdotes, or examples. Readers LOVE stories because they are interesting and “sticky,” which means they’re memorable. Prod your subjects for these little gems. When you’re interviewing be sure to give your subject lots of feedback. You can do this by paraphrasing, which is simply rewording what they’ve just said to you. Let’s take this famous example. You might respond in paraphrase, “So, Hamlet, you’re considering suicide.” And if that takes too much thought, simply repeat what you’ve just heard: “To be or not to be?” But add a question mark in your voice. In addition to paraphrasing, you should engage with your subject, and show that you’re interested in what they’re saying. Okay, maybe leave that third one out if you happen to be interviewing Hamlet. Your own genuine interest and excitement should make the interview more like a conversation than a cross-examination. Also, be aware that there’s no such thing as a one-interview bio. Be sure to talk to family or friends of theirs for extra stories. In fact, in some cases, you’ll be relying on these people for important information. I’ll also provide a link below to a blog post I wrote on the topic of asking the right questions. Thanks for your question, Roger. Good luck with staying in control.